Coming with a 4″ WVGA screen, a 1.4GHz Scorpion CPU and a 1500 mAh battery, you would expect the Wave 3 to be no better than average. However, much to our amazement, it turned out to be the second best performer we have seen. The surprises started with the very first test. 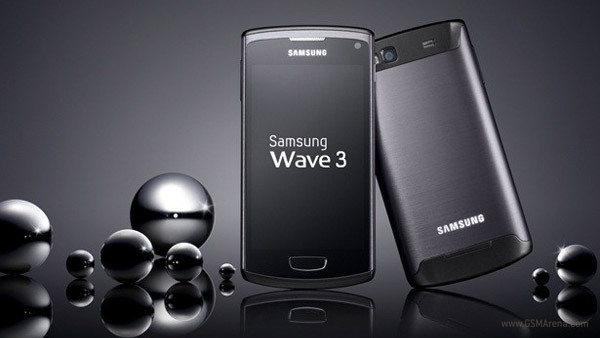 According to Samsung, the Wave 3 S8600 should last for about 8 hours and 40 minutes of 3G talk time. However our unit pulled off a miraculous performance, taking 11 hours and 7 minutes of talk time over a UMTS network to deplete its fully-charged battery. Browsing is usually the Achilles’ heel of AMOLED screens, as the predominantly white web pages tend to be very taxing on them. For example, the Galaxy Note would have probably topped our charts if it wasn’t for its dismal browsing endurance. However, the Wave 3 pulled off a pretty good performance here, ranking somewhere in the middle of the pack. Lasting for 5 hours and 34 minutes, the Wave 3 wasn’t able to match the impressive Radar, but was more than one and a half times better than the aforementioned Note. For the browsing test we use an automated script, which reloads a page every ten seconds. There are no flash elements on the web pages, so the playing field is even. The brightness of the phones’ displays is set to 50% and we use a Wireless N connection, with the router placed a few meters away from the tested phones, so we are getting full bars on every one of them. The third test that the Samsung Wave 3 S8600 had to go through was SD video playback and at this point we were already expecting it to do well here. Doing 7 hours and 52 minutes of video playback with the brightness set to 50%, the Bada flagship didn’t disappoint. Finally we came to the most important test – overall usage. 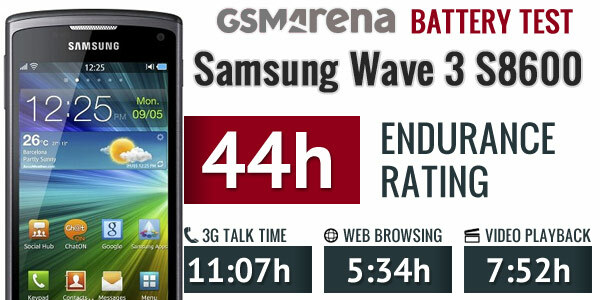 The Samsung Wave 3 S8600 had reasonably efficient stand-by, which combined with its great performance in the different tasks allowed it to get an endurance rating of 44h. This means that if you use the smartphone for an hour of browsing, video playback and 3G calls each day, you’ll have to charge it every 44 hours. That’s the second best overall achievement in this test, falling just an hour short of the Apple iPhone 4S.